Indonesia has signalled its discontent with recent speculation in the Washington Post about American reconnaissance aircraft including Global Hawk drones flying from the Cocos Islands (a Australian territory located close to the Indonesian archipelago). Coordinating Minister for Political, Legal and Security Affairs Djoko Suyanto announced Indonesia had issued a protest note to the US and Australia. The move came after a day of restrained statements that only affirmed good relations with both partners and the benefit of US regional presence for regional disaster relief operations. At first, it was unclear why Indonesia was so reserved. There was no substantial comment in major English and Indonesian language media in the days after. The Washington Post article provided only speculation about drones from the Cocos Islands rather than a concrete announcement. The protest note could be seen as commensurate with the significance Indonesia thinks it deserves. On the Australian side, Defence Minister Stephen Smith has played down the potential of such plans. Yet in November 2011, the announcement of plans to base US Marines in Darwin was quickly met with strongly worded caution about containment of China from Indonesian military (TNI) chief, Admiral Agus Suhartono, and Foreign Minister Marty Natalegawa. These statements seem in keeping with Indonesia’s “dynamic equilibrium” approach. In this approach, regional institutions are strengthened and no single power dominates. A statement by Indonesia reflecting this approach and balancing the interests of the US and China in the Asia Pacific would have been expected. Another explanation is that Indonesia was waiting to produce a consolidated message. After Suhartono’s and Natalegawa’s comments, the Indonesian President Susilo Bambang Yudhoyono softened his country’s stance in declaring the stationing plans as non-threatening, pointing to normative constraints that would prevent the use of force in the region. Since then, a central theme in Indonesia’s reaction to US troops in Darwin has emerged: no problem. This stance was echoed by Natalegawa’s recent statements during the so-called “2+2 talks” in Australia this month and a Defence spokesperson’s comments two days ago. I am 90 per cent sure the Indonesian government was blindsided on this and they are still not fully in the picture … They will look at Cocos Island, which is closer to Indonesia than Australia, and will think, good god. In Jakarta there is a well-disposed government but they will be scratching their heads and wondering where the Australians are going on this. This view was supported by an Indonesian researcher who suggested that the TNI leadership was totally unprepared for the announcement. Dupont goes on to argue that Australia again could be perceived as the ‘Deputy Sheriff’ of the US, a characterisation that was often used by regional leaders like Malaysia’s former Prime Minister, Dr Mahathir Mohamad, to discredit Australia’s Southeast Asian credentials. It is in Australia’s best interests to resist this characterisation. While we continue to deepen our military ties with the US, our engagement with the region should not be seen as an extension of US policy. If Dupont is right, Australia is out of step with its most important regional defence partner. As Indonesian reactions to both US Marines in Darwin and drone launches from the Cocos Islands attest, Australia could do more to sell closer US-Australia ties as non-provocative. As recent public debate and statements from Australia’s political leadership suggest, we wish to draw closer to Indonesia, not further away. The situation remains ambiguous on both sides. Yet, Smith, in playing down the Cocos Islands plan could have done more to reassure Indonesia that regional partners would be consulted in due course. While the future of drones from the Cocos Islands plan is yet to unfold, it is clear Indonesia is not happy. Image courtesy of Embassy of the Republic of Indonesia, Canberra. This entry was posted in ASEAN, Australia, Foreign Policy, Indonesia by Natalie Sambhi. Bookmark the permalink. This seems like another example of this government’s terrible communication efforts, similar to when Gillard proposed an asylum seeker processing centre in East Timor without first consulting them. If Dupont’s right, this latest failure to consult or at least inform has annoyed a much more strategically important neighbour. But I wonder, how concerned would Indonesia be by a US military and intelligence build-up in Australia, if things had been done differently and Indonesia was informed or even consulted well in advance? Like Dupont, I would have thought that Indonesia would still be very concerned. Australia used US technical assets to spy extensively on them in 1999, in the lead-up to the Timor intervention. According to Desmond Ball, the US tapped the Indonesian military’s underwater cables, realigned a geostationary satellite, delivered tonnes of additional computer hardware when Australia was running short, deployed E-P3 ARIES (recon aircraft) over Indonesia, and provided many other spying capabilities that made the East Timor intervention successful. So US-Australian military and intelligence cooperation played a role in Indonesia losing what it regarded as rightful territory. 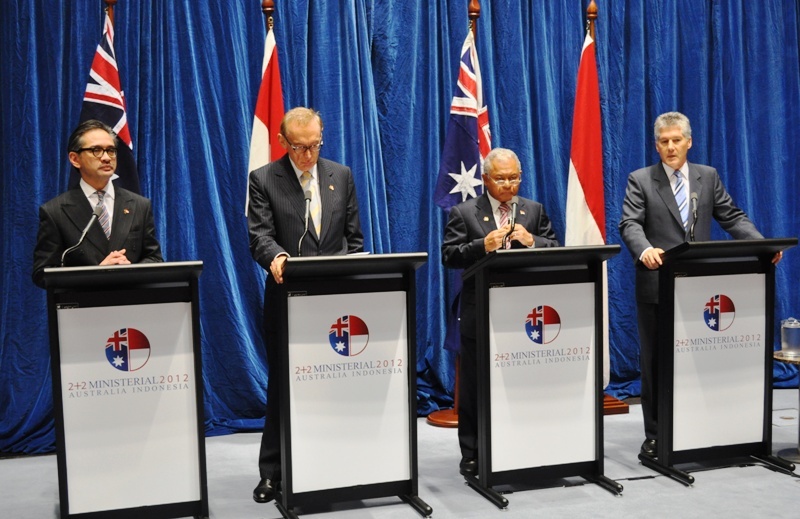 Given the potential for future disputes between Indonesia and Australia, and that Indonesian politicians sometimes accuse Australia of trying to separate Papua (according to the latest Lowy poll a majority of Indonesians agree), then it is likely Indonesia wouldn’t be pleased with this development even if they were consulted or informed in advance. A final point is that, contrary to Dupont’s position and in support of the “no problem” position, Kim Beazley has argued that Australia’s purchases of sophisticated aircraft, submarines and such over recent decades didn’t negatively affect relations with Indonesia, and possibly boosted them. At a Coral Bell lecture in 2008 he stated “I had been encouraged in this thought by my Indonesian counterpart, the late Beni Moerdani, who told me that whenever his colleagues got stroppy about Australia he would remind them that Australia had an aircraft that could project a bomb through the window onto the table in front of them”. From what I’ve heard, the lack of consultation over the Darwin troop deployments rankled. A major strategic shift involving Indonesia is something that (rightly or wrongly) members of the establishment believed they should have been communicated to about, instead of finding out mere hours before the public announcement. The Lombok Treaty was supposed to signal greater mutual involvement in matters concerning the security of both countries. They communicated their displeasure over this (rather than the deployment itself) privately, and thus for it to happen a second time within a year is rather shocking. Either Australia does not trust the Indonesians not to share information, or they consider that their opinion on matters is not sufficiently important. Either prognosis isn’t flattering.